36 x 30 Inch Lowboy Cocktail Round Stretch Spandex Table Cover Burgundy - Your Chair Covers Inc.
36 x 30 inch Spandex Lowboy Cocktail Table Covers in Burgundy. Stretch Tablecloths for 36" x 30" Round Top Cocktail Tables. 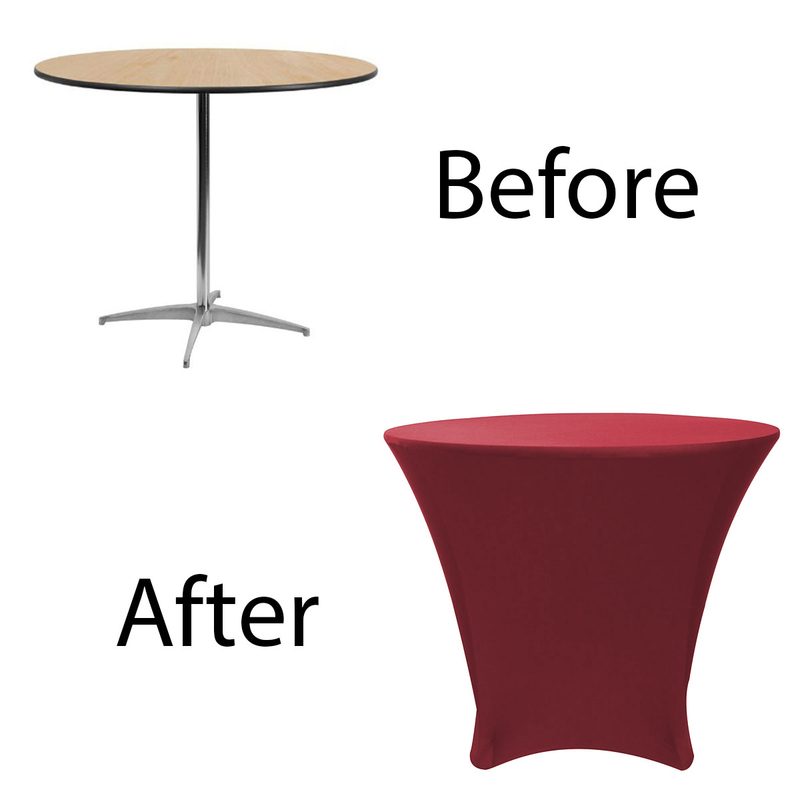 Made from high quality four-way stretch spandex material, our Burgundy stretch spandex 36 inch round lowboy cocktail table covers exemplify modern sophistication and luxurious elegance. They are designed to fit 36" round lowboy tables with 30" height at weddings, casinos, hotels, restaurants and other special events. 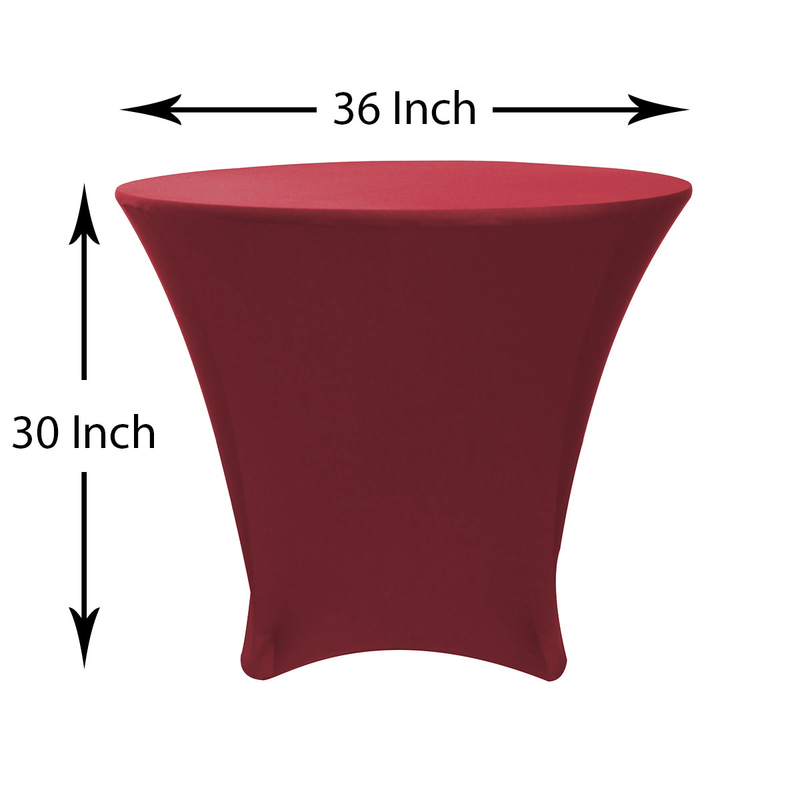 Burgundy spandex lowboy tablecloths from Your Chair Covers feature deep canvas foot pockets, are durable, do not require ironing and can be laundered countless times. CARE INSTRUCTION. Machine washable with water (cold or room temperature) in gentle cycle. Use normal detergent. Bleach is not recommended. Don't wash with other materials. Wash like colors together. Tumble dry with low temperature. Avoid overloading the machine and make sure that both the washer and the dryer are in good working order. Gradually dry in dryer to avoid temperature shock. For help on how to determine the right tablecloth size, please use our tablecloth sizing chart. For an enhanced look, we recommend using table runners, table overlays and cloth napkins in complementing colors. If you are in Los Angeles County and Orange County in California, you are welcome to stop by at our corporate office and warehousing facility in Sun Valley. We are offering pick-up options for Greater Los Angeles, San Diego, Orange County and downtown LA linen shoppers. We recommend placing the order over the phone prior to your visit. To be more efficient, kindly give us a call at least an hour before your intended pick-up time.